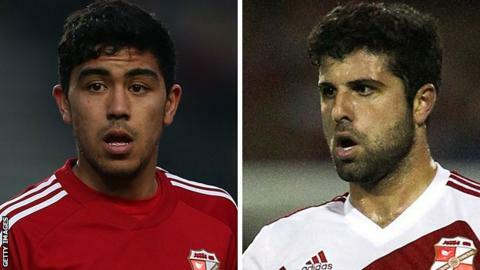 Swindon will cope without international duo Massimo Luongo and Yaser Kasim in January, says manager Mark Cooper. The former Tottenham midfielders will be unavailable for the next month as they head off to play in the Asian Cup - Luongo representing hosts Australia and Kasim in the Iraq squad. Swindon, who are second in League One, will also be without Jake Reeves after his short-term deal expired. "I'm sure we'll be fine," 46-year-old Cooper told BBC Wiltshire. Asked about possible additions to his squad during the transfer window, Cooper added: "We'll get someone in and work them into our way of playing and thinking. "We're not going to bring in anyone who hasn't played the style we play. We'll bring someone in who can handle it." Kasim featured in Swindon's Boxing Day win over Walsall before flying out to train with his international team-mates. Luongo, meanwhile, stayed on to play in Sunday's victory over Port Vale and was named man of the match. "I thought he was incredible," said Cooper after the win, which kept his side in the automatic promotion places. "We asked Massimo to be the holding midfield player. I'd seen him do it before in the Championship, so I knew he could do it, and I thought he was outstanding. "I'm sure he leaves us with a heavy heart. He's desperate for the club to do well and he goes with our best wishes. "He could have ducked out, to make sure he didn't get injured, but he wore his heart on his sleeve and sweated blood for the cause. That's the kind of player we need."